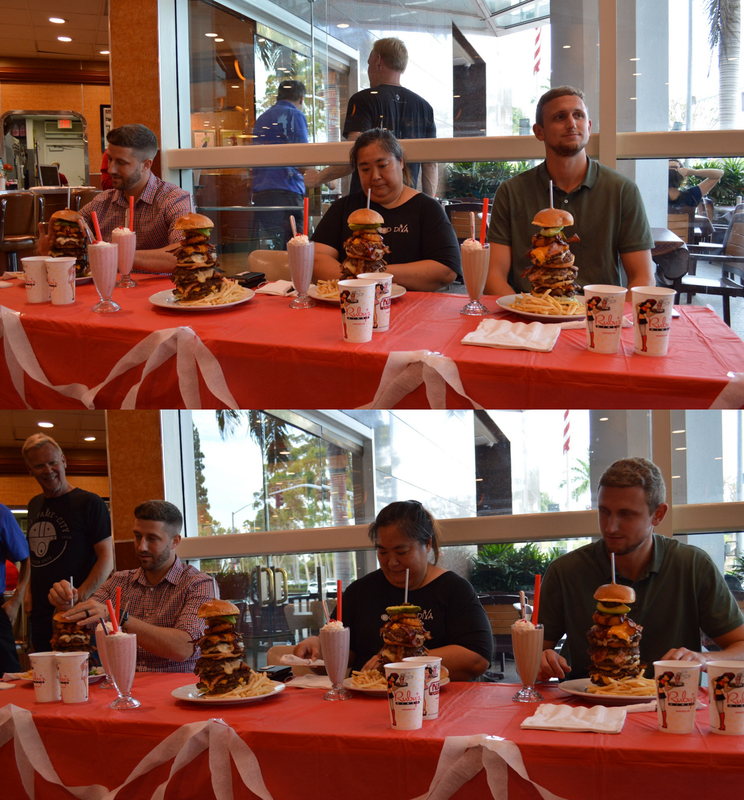 GIVEAWAY | Ruby's Stack Attack Challenge Features a Massive 3.5 lb Burger - EAT WITH HOP! I was invited as media to check out the Ruby's Stack Attack Challenge at the South Coast Plaza location and it was intense! I watched three foodies throw it down trying to completely finish a giant burger, milkshake, and fries within 35 minutes. Do you think anyone actually finished it? I mean... JUST LOOK AT THIS MASSIVE BURGER! Three foodies were invited to do the challenge: @FoodieOC (Buddy), @OCFoodDiva (Chelsea), and a Ruby's Diner fan (I'm sorry I forgot his name). It was fun watching them compete against each other once the timer started! But who do you think won this contest!? I'm glad I was just a spectator, enjoying my own normal sized burger because there is no chance I could finish an entire burger made of 6 burgers! The three foodies, all had their own technique of eating the burgers. I think the most effective way was eating every part individually taking it one step at a time. After 35 minutes had passed, surprisingly, no one had completed the challenge. But the closest person to finishing was the Ruby's Diner fan (the dude on the right)! He basically finished most of the burger but still had the fries and most of the shake first. But damn, that's close compared to the other two! Meanwhile, I enjoyed my own Ruby's anniversary burger! Yum! I enjoyed the burger which is quite basic. The fries were plain though and I had to add a lot of salt and pepper to it. Although nobody successfully completed the Ruby's Stack Attack Challenge among the three foodies, there is still hope! In the history of Ruby's Diner offering the challenge, one person was able to do it! 6 TOWERING BURGERS - COULD YOU FINISH THIS?! Get your meal for free if you can finish this towering burger + fries + shake all within 35 minutes! It costs $35 to try the challenge (free if you can finish it!). The challenge will be available through the end of December 2017! For my November monthly giveaway, I am excited to collaborate with Ruby’s Diner! WOO! One lucky taste bud will be chosen to try the Ruby’s Stack Attack Challenge for free! Or you can order anything else to your liking if you don’t dare try the challenge. The winner will be receiving a $35 gift card to any Ruby’s Diner! Do you think you would be able to take on the Ruby’s Stack Attack Challenge successfully? 2. (Optional) Link up with Ruby’s Diner on social media to stay updated on their promos! 3. (Optional) Support the Eat With Hop! blog by connecting on social media! Subscribe to the weekly newsletter here. 4. (Optional) Spread the word! Share this blog on your social media and your friends! Tell them to enter so y’all can share the winnings. 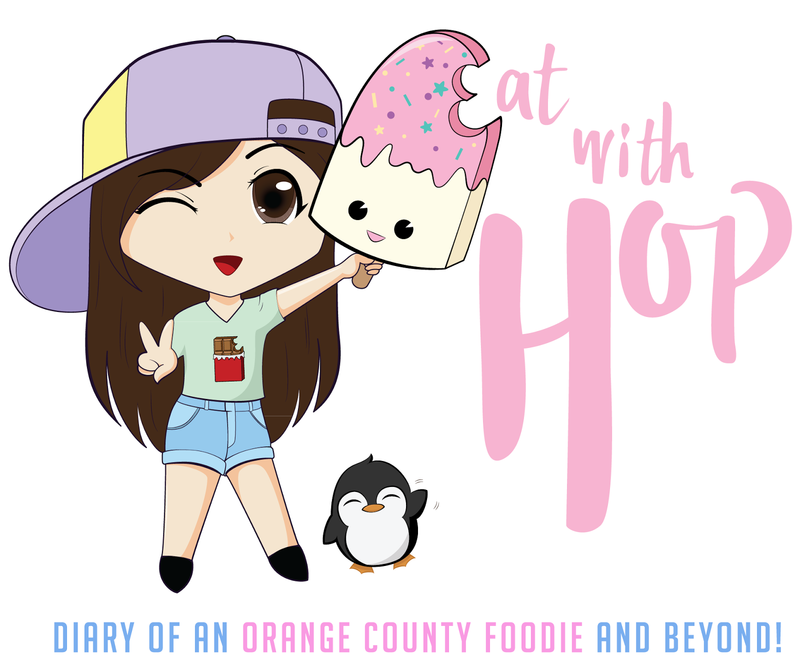 *Note: By entering the giveaway, all participants agree to be subscribed on the weekly Eat With Hop! Newsletter. Don't worry, I won't spam! And y'all can unsubscribe anytime! GIVEAWAY ENDS NOVEMBER 30, 2017.